Tallan’s UX Envisioning with the Crowd is a hybrid design management methodology. Tallan’s veteran UX technologists leverage the creativity and variety made possible by crowdsourced design competition to power the design phase. Then, through research and analysis, creative strategy and direction, we drive your UX project from an idea to development. Designing an optimal User Experience requires a lot of time and effort. Leveraging limited in-house staff or managing freelancers can increase project management effort while limiting the breadth of design possibilities. In-house creative staff or individual freelancers can only contribute so much. With limited creative staff, project timelines are much longer, inhibiting your speed to market. Design projects require collaboration on various levels, adding to the workload of designers, managers, and executives in achieving project goals. Let our veteran technologists plan and manage your UX project, leveraging crowdsourced creativity. Competition-driven design casts a much wider net and with it gathers a wider variety of creativity, from talented designers all over the world! With that wider net cast, we can gather many more design pitches in a much shorter period of time, eliminating back and forth between a few designers, and collapsing your project timeline by days or even weeks. Crowd-based envisioning managed by Tallan UX experts allows your staff designers, marketers, and even executives, to spend less time worrying about your project, and more time to getting strategic. Our team conducts user engagement analysis and interviews to define user models and application flow. From this intel, we create design specs for optimal contest engagement. Empowered with your vision, our designers and project managers bring your project to the crowd, guide and manage the process and present the best submissions for your project needs. From crowd submissions and our collaboration, we take the best elements and work them into a living project style guide. Depending on our engagement, we can provide you with the design to move forward with internal UX resources, or work together to bring this vision to life. After completing our UX questionnaire, we’ll set up a digital meeting with your key team members and our UX strategists to understand your UX needs, develop recommendations and an initial project outline. With a project or two in mind, we meet with your key team members and executives to educate and brainstorm on what’s possible, and create an initial statement of work. We bring the creativity and excitement of a UX design competition to you! Think of our UX Rallies as the NFL Draft of design talent. As your project competition runs, we eat, drink and collaborate to award your winning designs and get your project moving! 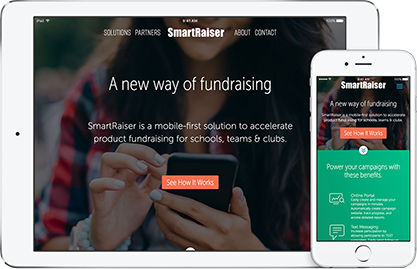 By creating a fresh visual design, updating their branding, and adding responsive capabilities, Tallan provided SmartRaiser with an updated website that better aligns with their mission to create smarter and easier ways to raise funds through modern technologies.